This was huge in South Korea, but didn’t go over that well with American audiences. Can’t say how much was culture clash or really bad storytelling. Hate to bring in marketing lingo but it applies here: Know Thy Audience. “D-War” seemed like a better fit for kids. A teen/tween hero on a quest -- ala “Transformers” -- probably would have gone over better than two starcrossed, twenty somethings mired in melodrama. The special effects are pretty good, not mind blowing -- even though three years were spent working on them. The big finale between the two cgi creatures is as boring as you’d expect. Hated it in “Van Helsing” and “Transformers”. No stakes. No tension. 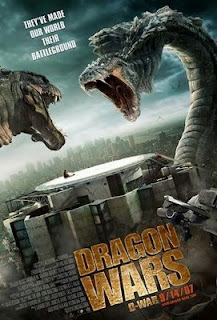 Can’t remember the last time a dragon movie was a hit. “Eragon” was hyped to death and did only so-so business. Still, it must have made some money because there’s a sequel in the works.